Pie chart showing party wise 2016 election results for Assam. 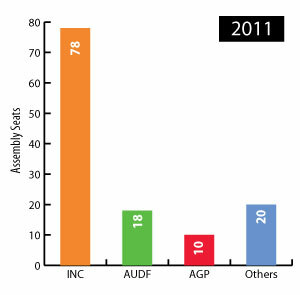 Also shown along are 2011 pie chart showing the number of seats won by INC,BJP, AGP and Others. The 2016 Assam Assembly election was held in two phases on 4 and 11 April in 126 constituencies of the state legislature. The overall voter turnout was 84.72%. Polling statistics indicated that there was a high degree of anti-incumbency working against Tarun Gogoi and Congress which had been in power in the state for three consecutive terms since 2001. The BJP capitalised on anti-incumbency and forged crucial alliances with regional heavyweights BPF and AGP. Results were declared on 19 May and the BJP emerged victorious in the frontier state. 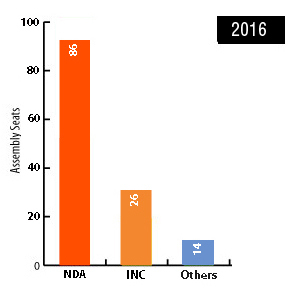 The BJP toppled Gogoi's Congress government by winning 86 of the total 126 Assembly seats. The election outcome confirmed that the Assamese electorate had voted for change. BJP leader Sarbananda Sonowal was sworn-in as the chief ministe on 24 May 2016. Sarbananda Sonowal, who was formally appointed as the Assam CM on 24 May, is heading the first BJP-led government in the state. His cabinet has 10 veteran politicians, including two state ministers. Himanta Biswa Sarma, a former Congress leader, was given the portfolio of Finance & Forest. He is considered the most successful health and education minister that Assam ever had. Now, that portfolio will be handled by Hiten Goswami. Ronjit Dutta, former State unit president of the BJP, has been given the responsibility to take care of the Public Works Department. 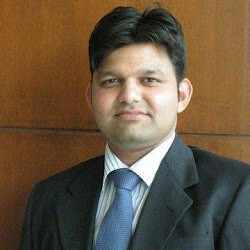 Aminul Islam Laskar, perhaps the only Muslim candidate who has won from BJP, will handle the Minority Development & Haj. The two AGP members who have found place in Sonowal’s cabinet are Atul Bora and Keshab Mahanta. Although they are veteran politicians, but they had never been ministers. Atul Bora (Senior) will handle the Public Health Engineering department and Atul Bora (Junior), who is the president of the AGP, will take care of the Irrigation department. Chandra Mohan Patowary, who had served as health minister and agriculture minister during AGP governments, was also inducted in the cabinet. Promila Rani Brahma, a senior Bodoland People’s Front (BPF) leader, has been chosen as the Minister of Welfare of Plain Tribes and Backward Classes. The Congress has not engaged in any pre-poll electoral alliance though it seems open to that option once the results are out. The BJP already has the Bodoland People’s Front (BPF) on its side. It has also forged a crucial tie-up with the AGP. The All India United Democratic Front (AIUDF) has struck an alliance with JD(U) and RJD to fight the ‘communal’ BJP together in Assam. The state of Assam is a very important state of India when it comes to the politics, and governance of the country. From the very first day of being a state, Assam had an impact on the politics of the country, and it has always been in the news for that. The state has a government of its own, which is, under the government of India, runs the state, and is responsible for every development actions of Assam. This is one reason why the state has to organize an election periodically and select a new government or keep the one that ran the state for last 5 years. The election of Assam is conducted under the rules of Indian constitution, and so the arrangements require proper actions from the central government of the country. The state has a total of 126 constituencies. The political parties of Assam put their candidates on the seats in the election. Congress is the most powerful political party in Assam in terms of results, and it has won the election back to back in last 3 years. Assam has other political parties putting their candidates in the election too, in different constituencies of the state. However, Congress won convincingly in the last election. Assam sends 14 Member of Parliament(s) to the Lok Sabha. The state of Assam has one elected legislature which meets in Dispur. The Chief Minister (CM) is the elected head of the government and reports to the Governor of Assam. The Governor is appointed by the Central government and has the power to remove the CM. The state is divided into three regions. Every region is headed by a commissioner. Under each commissioner, there are several administrative units called Districts. Assam has been mired in a number of problems for several years. The issue of illegal immigrants and ensuing violence is still fresh in the memory of not just the Assamese but every Indian citizen. However, as detailed analysis of the issue revealed, the problem is just a symptom of a larger malaise. The main issues burdening the Assamese people are inflation, unemployment and rampant corruption. Though unemployment is a problem everywhere, it has become a major issue in lower and central Assam. Other issues affecting the locals are lack of basic infrastructure like electricity, motorable roads, drinking water and surge in militancy. No wonder, the influx of illegal immigrants from across the border puts bigger pressure on limited resources. This has seriously affected the law and order situation in Assam and become a major roadblock to the state's development. The people of Assam are losing patience with the rising corruption and Congress' token efforts to rectify the situation. Indian National Congress : The state unit of the INC is called the Assam Pradesh Congress Committee or APCC. It was formed in the year 1921 and is headquartered at Rajiv Bhavan, Guwahati. At the time of its formation in the state, Kuladhar Chaliha was the president. Currently, the Chairperson of the Assam Pradesh Congress Committee is Bhubaneshwar Kalita. It has many ancillary wings, such as the National Students' Union of India, the Assam Pradesh Youth Congress, the Assam Pradesh Mahila Congress, and the Indian National Trade Union Congress. On the political spectrum, the INC is believed to be centre-left. BJP : Assam's State President of BJP is Sarbananda Sonwal, who is also an ex-MP. The BJP office address is Atal Bihari Vajpayee Bhawan, Near Hengrabari L.P. School, Hengrabari-36, Guwahati (Assam). The phone numbers are 0361-2355522 and 09435531147. Assam's State Prabhari is S.S. Ahluwalia, whose office address is 10, Gurudwara Rakabganj Road, New Delhi - 110 001, and phone numbers are 011-23722826 and 09868181816. Mass organizations of the party in different fronts are Akhil Bharatiya Vidyarthi Parishad (student wing), Bharatiya Janata Yuva Morcha (youth wing), BJP Mahila Morcha (women's wing), and BJP Kisan Morcha (Peasant's wing). In a latest development, Rituparna Baruah, the All Assam Students' Union's general secretary has joined the BJP recently, boosting the BJP camp. AIUDF : The All India United Democratic Front or AIUDF is an Assam-based political party and is also spreading its reach in other states such as Odhisa, Mizoram, West Bengal, Jharkhand, Maharashtra, Bihar, Chhattisgarh, Rajasthan, Delhi, and many others. It came up as a significant political party when in the 2011 legislative assembly election it won 18 seats and became the main opposition party in the state. The AIUDF, formerly known as the UDF, contested 14 Lok Sabha seats from West Bengal in 2009. The President of the party is Maulana Badruddin Ajmal, who stresses on good governance, and swears to unveil the 'real picture' of Assam government's development. The party wants to showcase how funds from different government schemes and projects are being misused. Currently, the AIUDF is reorganising the party right from the grassroots. Dr. Baharul Islam, General Secretary (Organisation) of the party, has been entrusted with the responsibility of preparing the next-generation leadership, especially from the youths of Assam. Bodoland People's Front : It is a state-level political party and is considerably strong in and around Kokrajhar and Autonomous District. During the 2009 general election. Sansuma Khunggur Bwiswmuthiary became its first MP, elected from Kokrajhar. In 2008, Biswajit Daimary was the first person to be elected from the Rajya Sabha. In the 12th Assam Legislative Assembly, the Bodoland People's Front won 10 assembly seats. Currently, it is a constituent of the ruling coalition government of Assam. It won 12 seats in 2011 Assam Assembly election. Indian National Congress always has a monopoly in the state since independence. Howvere, the year 1978 saw exception when the Janta Party emerged as a winner in the general Assembly elections but enjoyed power only for two years as they got defeated again by INC. Between 1985 and 2006, Indian National Congress and the Assom Gana Parishad took to political power alternatively. However, INC is in power since 2006. Asom Gana Parishad: The Asom Gana Parishad is all set to contest the election all alone. They don't want to ally themselves with BJP anymore because in the party many believe that during the 2009 Lok Sabha election the AGP's votes were transferred to the BJP but not the other way round. Interestingly, the AGP has formed a united political front in the northeastern states, which they call North East Political Front (NEPF), for contesting the 2014 General election. N. Rio, Chief Minister of Nagaland, is the chief convener of this front. AIUDF The All India United Democratic Front's main poll plank will be to target the ruling Congress's anti-people stands. One of the main strategies of the AIUDF is to highlight the government's failure to check price rise of essential commodities in Assam. The party has also written to the Prime Minister about this. They have highlighted that illegal tax-collection at various check gates and black marketing as the main reasons of soaring prices of essential commodities. The party is also highlighting escalating tensions between different communities in Assam during the INC rule. Law and order in the state is in shambles and the cases of murders, extortions, and kidnappings are rising regularly. The AIUDF is also highlighting the issue as one of their main Lok Sabha 2014 poll strategies. Assam has strategic significance when it comes to its location. It is one of the seven states of Northeast India. This state is connected to mainland India through the Siliguri Corridor, a narrow strip of land in West Bengal. Assam shares international borders with foreign countries such as Bangladesh and Bhutan. As per 2011 Census, the total population of Assam is 3,11,69,272, where 1,59,54,927 are males and 1,52,14,345 females. Decade on decade, the population has grown by 16.93%. The total population living in rural areas is 2,68,07,034 (85.90% of the total population), among which 1,36,78,989 are males and 1,31,28,045 are females. The urban population is just 43,98,542 or 14.10% of the total population. The male-female ratio of the state is 954 females to every 1,000 males. The literacy rate is 73.18% (1,95,07,017 persons), among which male literacy is 78.81% (1,07,56,937 persons) and female literacy is 67.27% (87,50,080 persons). The population of Assam is concentrated in seven districts: Cachar, Kamrup, Darang, Nagaon, Dhubri, Barpeta, and Sonitpur. As per estimates there are 115 ethnic groups in Assam. Interestingly, there are 23 STs in the state, of which 40.9% are Bodos. As per the 2001 census, the religion-wise breakup of population is: 1,72,96,455 Hindus, 82,40,611 Muslims, 9,86,589 ﻿Christians﻿, 22,519 Sikhs﻿, 31,029﻿ Buddhists, and 20,957 Jains﻿. Other religious communities make up 29,999 people. The languages predominantly spoken here are Assamese, Bodo, and Bengali (especially Sylheti). BJP was hoping for a victory in the state of Assam and got 50 % of the seats from the total seats i.e., seven seats from the 14 seats. INC won three seats and All India United Democratic Front (AIUDF) won three seats. The state of Assam is also an important state in terms of Indian politics. It gives a share of 14 Lok Sabha seats in the Indian Parliament. The national parties in the Assam includes Indian National Congress (INC), Bharatiya Janata Party (BJP), Communist Party of India (CPI). The Congress has a stronghold in Assam with majority victories in the state in the last Lok Sabha elections. 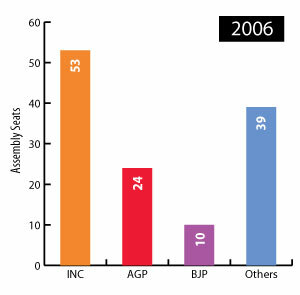 In the 2009 elections, seven seats were won by Congress, 4 by BJP and the remaining seats by other regional parties. The 2014 Lok Sabha elections were held in three phases in the state of Assam. In the last General election, held in 2009, 7 seats were won by the Indian National Congress (by securing 34.89% or 42,35,681 votes), 4 seats by the Bharatiya Janata Party (by securing 16.21% or 19,67,813 votes), 1 seat by the Assam United Democratic Front (by securing 16.10% or 19,54,901 votes), 1 seat by the Asom Gana Parishad (by securing 14.60% or 17,73,103 votes), and 1 seat by the Bodaland Peoples Front (by securing 5.41% or 6,56,430 votes).